It's taking a much closer look. Children often read the words on the page very literally and fail to discover the deeper message of the text. By teaching the process of making inferences, students learn how to think deeply about the books they read. Lab coat, safety goggles, flasks. 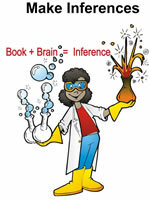 Phrase: "I use the book plus my brain to make inferences"